Happy Monday! Hope you all had an amazing Thanksgiving break! We had a fun first Thanksgiving in CO, complete with a bacon wrapped turkey, the kids' favorite side dishes, and lots of Black Friday shopping. I had good intentions last night of making some sort of fancier bento for the kids, since we've been doing simple ones lately. But, while cleaning up from dinner, I heard a bang. Now, living on post, there are cannons and all sorts of things that go bang, but this bang came from my fridge. I assumed the fridge was dying and was wondering what i was going to do with 3/4 of a bacon wrapped turkey (yeah, kind of overshot the turkey purchase). Either way, I opened the fridge, which is just fine, to discover that a can of biscuits exploded. So I did what anyone would do with a can of biscuits that had popper, we made pizza biscuits! 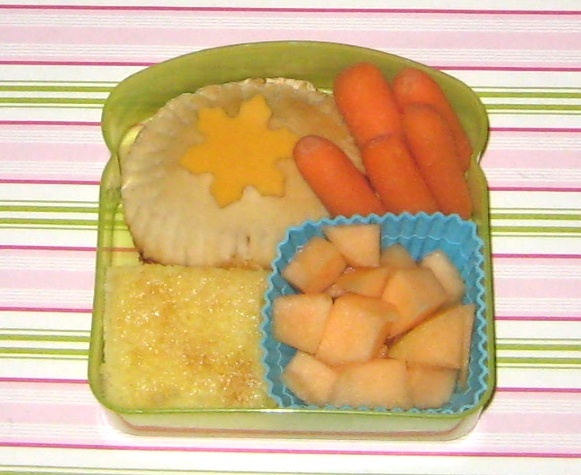 So, boring bento today, but at least I didn't waste the biscuits! 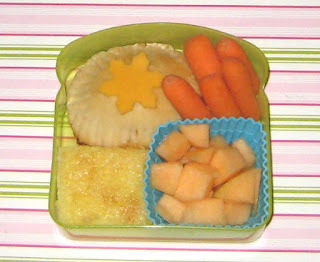 At least no one was harmed in the making of this bento! LOL! Looks tasty to me! I didn't know those cans could just pop on their own! I usually have to bang them over and over on the counter lol.